Syracuse University is one of more than 55 colleges and universities competing in the 2015 Outdoor Nation Campus Challenge. Outdoor Nation, the national initiative that connects college students and their communities to the outdoors, launched the competition on Sept. 6. Students, staff, faculty, alumni and community members can participate in the competition and log their activities as part of the Syracuse University team. Participants can log outdoor activities ranging from biking to bird-watching to hiking to walking and more. Once participants have signed up, they can record up to five entries per day, including the activity, a photo and minutes spent on the activity. Two outdoor group activities are planned for the month of October, including a Green Lakes hiking trip on Oct. 3, and a Mountain Biking Demo Day on Oct. 4. Details and registration for these activities will be available on the Recreation Services website on Monday, Sept. 21. Valid SU/ESF ID are needed to participate in these events. 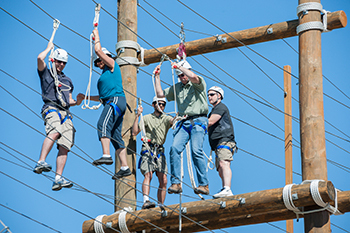 The 2015 Campus Challenge aims to engage young people in outdoor recreation, rewarding schools with the most outdoor activities logged by the most people in their campus network (students, faculty, alumni and local community). The school with the most participants and outdoor activities will be named the National Outdoor Champion, and the top individual will be crowned Outsider of the Year. Staff members tackle the ropes course at Skytop. 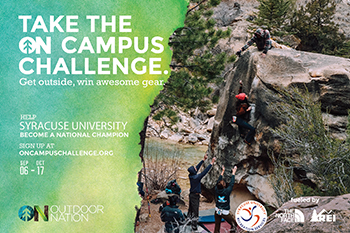 To join the competition, sign up on the Outdoor Nation Campus Challenge website. Participants will have the opportunity to win weekly prizes. Colleges and universities will also have a chance to earn additional grants to fund outdoor activity during the spring 2016 semester. The competition ends Oct. 17. If you have questions or would like to get more involved, contact Stover at 315.443.5011 or lmstover@syr.edu. You can also visit the Outdoor Nation Frequently Asked Questions page for more details about the competition.